Located just a half mile south of the village and next door to the Vermont Horse Country Store, GMHA hosts a variety of equestrian events virtually every week from April to October. You'll find everything from competitive trail rides to hunter/jumper shows. You can join the organization and receive discounts on event entries and stabling as well as enjoying use of their extensive facilities and a wonderful newsletter. Many members take advantage of the facility to come to the area and ride on their own. GMHA is host to the oldest 100 mile trail ride in the country over Labor Day Weekend each year. There is truly something for everyone at GMHA! VERDA is a local organization which hosts several unusual events at various locations in the area. Among the best known is their January Thaw Ride, a competitive ride and drive held each January in South Woodstock. Another treat is their annual Eat-A-Thon, a progressive culinary ride and drive which takes place each October at rotating locations around the region. 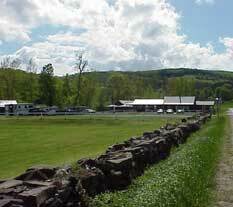 VERDA also hosts the Spring 100/60/25 Mile Drive held annually out of the Upwey Barn Complex at GMHA. This is the only 100 mile drive held without the support of a ride and the oldest one in the country. Membership in Verda will get you entry discounts and a great newsletter with lots of local gossip! VMHA is the organization charged with promoting and enjoying Morgan Horses here in Vermont, the home of the Morgan Horse. Each season they offer a broad range of activities featuring Morgan Horses including the Vermont Spring Classic, an "A" rated Morgan Horse show held each year in May, Heritage Days which features a show for juniors and amateurs as well as versatility, races and the Vermont Morgan Horse Association Breeder's Futurity held each year in Tunbridge, Vermont around the 4th of July. VMHA Also has a Stallion Service auction to help sponsor the VMHA Breeders' Futurity which has classes at The Vermont Spring Classic, Vermont Morgan Heritage Days and in the fall. For a complete list of activities check out the VMHA Home Page. The national breed association for the Morgan Horse, Vermont's state animal and an icon in Vermont history. It is also associated with the National Museum of the Morgan Horse which holds archives for the history of the breed and offers a museum and educational materials. (802) 985-4944. Visit the AMHA website at www.morganhorse.com.